Philips Flash unit with an adaptor for the new PF1 cap-less flash bulb, shown in the foreground, with the adaptor removed the unit takes a bayonet type bulb (fitted). Together with the original Bijou 3volt battery's. Since 1851 professional photographers used these cameras in their studios, once the process of glass plate negatives had been perfected. Other sizes of plate were half and quarter plate which were used by wealthy amateurs because of their convenient size. This type of Camera was taken into the Battlefields during WW1. Up to 1916 all photography on the front line was forbidden. The only pictures obtained were smuggled out, the government was trying to prevent the people at home from realising the true horrors. Later reporters and photography was accepted, these cameras were small enough to conceal in a soldiers kit, and were common for the time. Following on from the Model B this version is the same physical size the bellows folds out instead of pulling out as in the model A. It uses 127 roll film. When viewed through a stereoscope pictures appear as 3D.To create this effect two pictures are taken with a dual camera (Stereo) at the same time. The photos shown here are of images taken during the First World War, they can be viewed with this device. Cine Camera where the developed films would be shown on Projector item A0906. 9.5 mm film is an amateur film format introduced by Path� Fr�res in 1922 as part of the Path� Baby amateur film system. It was conceived initially as an inexpensive format to provide copies of commercially-made films to home users, although a simple camera was released shortly afterwards. Van Neck Press camera originally from the 1940's with Kodak wooden Dark slide unit containing room for two 9 X12cm (4.25X5.25 inch) glass plates. The camera has a 6'' (roughly 152mm) Ross Xpress lens f/4.5 uncoated in a lever-operated helical focusing mount, which is scaled from 2 to infinity in yards, the roller blind focal plane shutter has speeds from 1/10 to 1/1000 sec, plus a flash sync setting. On the top is a bracket for a folding reflector flash unit using a small flash bulb, and the connection is via two contact strips next to the flash bracket. These were hand made cameras heavy and durable, necessary for professional press photographers who carried no gadgets to help them with the shot distance and exposure, which were decided by experience. Even when a roll film attachment was provided for this camera the press photographer would still prefer the glass plates, as his darkroom was set up for these. 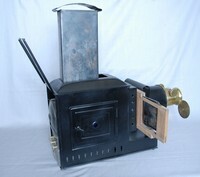 On the back interchangeable with the slide unit, is mounted a screen and hood assembly used for focusing if necessary. In a period when the old Edison screw type flash bulbs were being replaced with the new miniature cap less types this unit was introduced to cope with both. With the added advantage of a capacitor to ensure guaranteed success, also a test light is provided which provides a sharp flash if the bulb and battery is in good order. A range of cables can be supplied to fit most types of camera. This unit has an old type bulb fitted and the new type with its adaptor in the foreground. Shown fitted to the Van Neck Press camera Item A1478. Early Flash Bulb, this has an Edison screw type cap. Instead of Magnesium wool this one uses Magnesium foil. Two Plug in Flash bulbs for domestic camera flash attachments. Later versions removed the expensive bayonet cap, and replaced it with a plain glass base with two wires bent back to form a connection into a soft socket. The Thornton Pickard Junior Special Reflex Camera is a folding SLR for 3 1/2 � 4 1/2 " plates or roll film back. It has a fast focal plane shutter with speeds from 1/10 to 1/1000 sec., and a fast 6" f4.5 lens. The lens may be a Ross Xpress or a Taylor-Hobson Cooke Anastigmat. The camera is made of wood, covered with leather, and it has a revolving back. It's a heavy camera, weighing about 3 kg. Baby box cameras were started by Goerz in the 1930's and later taken over by Zeiss Ikon called the Tengor. Very popular with the masses as they were cheap and easy to use. 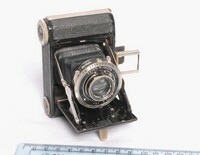 This one is a 54/18 model with the Goerz lens, the shutter cannot be released unless the wire viewfinder is raised. Used 127 roll film. �Brownie� was the name of a long-running and extremely popular series of simple and inexpensive cameras made by Kodak, the first Brownie was introduced in 1900 and was made of cardboard, as is this one. The Brownie popularized low-cost photography and introduced the concept of the snapshot. This was a later version of the �Box Brownie� A0727. Kodak's Baby Brownie camera had a plastic Bakelite body instead of the metal one usually found on the Brownie range. It also had a folding range finder on the top and a rotary shutter. 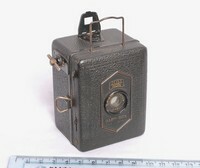 This model of camera was produced in the USA between 1934 and 1941. The 520/18 is commonly referred to as the "Baby Ikonta". Apparently it was available from about 1932 until 1936. It was available with a 50/6.3 Novar, 50/4.5 Novar or 50/4.5 Tessar initially, and in 1936 with either a 50/3.5 Tessar or 50/3.5 Novar. These were very small and pocket-able, measuring only 4 inches (100mm) by 1.15 inch (30mm). Most examples found today show wear to the black paint trim, with the exposed metal showing signs of rust, from being carried around. This camera is slightly smaller than the Box Brownie, notice the metal frame to line up the shot. Getting away from the box style the ensign Ful-Vue of 1950 was modern in design and became very popular, replacing an earlier type of identical design but with a metal lens plate. Using 120 roll film, and nothing more than a simple shutter with a large reflector type viewfinder, it did however have an adjustable lens working from just 3 feet to infinity. 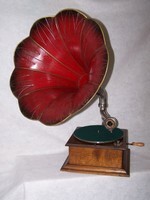 This was another example of the �Brownie� series, it is made of Bakelite and was very easy to use. Millions were sold between 1952 and 1967, the one shown was donated to the museum by its curator Rosie Hourihane, and was given to her by her father in 1955. It has been well used and is still much loved. Film for the Polaroid Cameras went out of production in 2007. Edwin Land also invented the first inexpensive filters capable of polarizing light. In the 1950�s Land helped design the optics that went into the Lockhead U.2 Spy Plane. Similar in style to the Kodak Junior I and II, this camera is slightly more sophisticated with its front-cell focusing lens in a four speed shutter with fully adjustable iris. The Land Camera 1000 is a foreign-markets version of the original Onestep model, meaning it has a fixed focus plastic lens. The model 1000 or original OneStep models are distinguished among the range in that they were made available with 2 different coloured shutter buttons - either green or red, a matching electronic flash was also released for the Onestep/1000 model, shown on top of the camera known as the Q-Light. It fits onto any SX-70 non-folding camera model, but was cosmetically matched to the original models. Also shown is a blank photo. Small pocket 35mm camera of the early 1980's. Many cameras were produced like this during this period, all with fixed lens and built in flash, with a short range of just 10 to 15 feet. There were a variety of models beginning in 1972 with the original SX-70, though all shared the same basic design. The first model, sold in Florida in late 1972, had a plain focusing screen (the user was expected to be able to see the difference between in- and out-of focus) because Dr. Land wanted to encourage photographers to think they were looking at the subject, rather than through a viewfinder. When many users complained that focusing was difficult, especially in dim light, Dr. Land was forced to include a split-image range finder prism of the kind used on 35mm SLR focusing screens. This feature is standard on the SX-70 Model 2. These cameras had a selenium photo cell meter built in, (for reference only) and were fully single lens reflex. When other SLR's were costing hundreds of pounds Dixons were selling them for just �30. These were made with a metal body, therefore were very hard wearing. Uses 1 X 22.5 Volt hearing aid battery. These were sold as a separate item, not like nowadays when the flash is built into the camera. Olympus Trip 35mm Camera Purchased 23/06/1984. Common cartridge film pocket camera, The very first 126 camera ever to be marketed, the Instamatic 50 was introduced in the UK in February of 1963, a month before the Instamatic 100 hit the market. Indication inside the case states that this one was made in England.They were very easy to use, just point and click. Hanimax Pocket Camera for a 110 size cartridge film. Also shown is the flash unit used with the camera. This camera takes a 16mm film cartridge, and uses magicubes,multi flash cubes, as shown. A very useful pocket size, made this camera very popular in the 70's. Two forms of Flash Cubes each with 4 flashes, they have two different mounting sockets for use with different types of camera. The large lens suggests that the magic lantern was used in theatres as it would need to be positioned a great distance from the screen. Illumination was by Carbon Arc (a high voltage such as ordinary mains voltage jumping between two carbon rods; a device was later incorporated to prevent overload). The slides were standard three and a quarter inch glass plates, often hand painted, or transparent positive photographs. The Magic Lantern or Lanterna Magica was the ancestor of the modern slide projector. In the 19th century a thriving trade of projectionists travelled around the United Kingdom with their magic lanterns and a large number of slides to put on shows in towns and villages. Some of the slides came with special effects, by means of extra sections that could slide or rotate across the main plate. One of the most famous of these, very popular with children, was The Rat Swallower, where a series of rats would be seen leaping into a sleeping man's mouth. During the Napoleonic wars, a series was produced of a British ship's encounter with a French navy ship, ending patriotically with the French ship sinking in flames, accompanied by the cheers of the audience. The museum is able to demonstrate this Magic Lantern and is a great favourite with school children. This Magic Lantern has an electric lamp mounted inside that looks original, although it is possible it may have been converted by a professional from an earlier oil lamp. The Magic Lantern or Lanterna Magica was the ancestor of the modern slide projector. The museum is able to demonstrate one of their Magic Lanterns and is always a great hit with school visits, the children can also handle some of the glass slides. This is a toy film projector with three small films. The films contained still pictures which had to be manually past behind the lens one picture at a time. A very sophisticated toy for the time. Slide Projector for three and quarter inch slides, in the photo you can see an extra lens. Photographic slide projector for single slides, two and one quarter inch square. 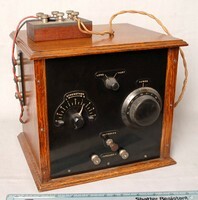 The Paillard Model �P� was introduced in 1932 and 9.5mm Film was introduced by Pathe� Freres in 1922 for the amateur market. Initially intended as an inexpensive means of providing commercially made films for the home. It became very popular in Europe over the following decades, and more than 300,000 projectors including the Model �P� were sold in England and France, and many well known films produced in the 9.5mm format. The film has a single perforation (sprocket hole) between each frame, unlike 8mm film which has holes along the edge. The single hole allows more room for the image, which is almost as large as on 16mm film. The width of 9.5 mm was chosen because three strips of film could be made from one strip of 35 mm film. This was useful when the films needed to be copied, as only one third of the length was needed then the 35mm copy could be cut into three strips and the sprocket holes added later. Various 9.5mm films on 170mm reels including cartoons Mickey Mouse, Popeye and Charlie Chaplin films. The company E Paillard was founded in 1814 and produced watch movements and musical box mechanisms. It wasn�t until 1922 that they introduced the Pathe Baby film system using 9.5mm film. In 1928 the first 16mm camera under the name of Bolex was produced. This model was made in 1952. 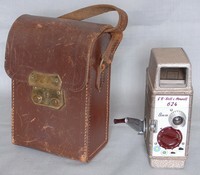 Bell & Howell 624 cine cameras were manufactured in Britain by the Cine and Photographic Division of Rank Precision Industries Ltd. The original design was evolved by the Bell & Howell Co. of Chicago U.S.A. and although the American model numbers were different, the cameras had similar specifications. The 624 cameras were made of light alloy, with winding handle and footage indicator on the right, spool chamber on the left and starting button on the front right-hand corner. The knob provides for single frames, normal intermittent or continuous running. This camera is a 624 Evolution Sundial model. It was first introduced into Britain in 1955. It has a single 10mm. lens with the aperture coupled to an exposure calculating dial on the camera front. In this way, exposure is set directly to the light conditions. This Projector uses a 16mm film, and is made by Simplex Ampro Ltd. The museum has several 16mm films, they are very fragile. This 16mm Projector was used at Dacorum Collage Hemel Hempstead up until 2005, it was found discarded in a skip, by a local friend of the Museum, he recovered it and donated it to the museum, we know him as bearded John. The 624 cameras were made of light alloy, with winding handle and footage indicator on the right, spool chamber on the left and starting button on the front right-hand corner. The knob provides for single frames, normal intermittent or continuous running. There was a tripod bush in the base with a standard 1/4 in. Whitworth thread. This camera is a 624 EE model. It was first introduced into Britain in the 1950's. It has a single 10mm. lens, also shown is an 8 mm film, this item is in excellent condition and the leather case is hardly marked. 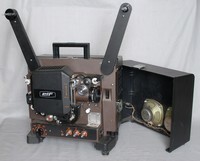 DV-2400 Reel to Reel Video Recorder. Known as the Portapak Video Rover, black and white Video recorder. With a maximum recording time of 20 minutes, the Sony �Video Rover� DV-2400 was one of the very first portable video tape recorder available to the general public. Sony Notes Below. Sony introduces the world's first portable VTR, the DV-2400. The VIDEO ROVER, was the first video portapack. it offered the format of the time which was B/W, skip field, Pre-EIAJ, 1/2 inch tape, reel to reel. This first unit was a record ONLY portapak VTR outfit. Recording time was 20 minutes on 4-1/2 inch reel of 1/2 inch videotape. streamlined for size and weight you were provided a small hand crank that stored in the units lid for rewinding the tape! Playback of tapes from this unit (after they were hand rewound) was accomplished on the CV-2000 series decks. A hand held camera Type HVC3000P for connection to a VCR, These cameras were connected with portable Betamax VCRs and used in the semi professional field such as high schools colleges and businesses and possibly low budget broadcasts. 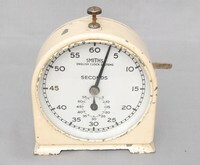 Well known wind up photographic darkroom timer used throughout the 1950's.